The closest public transportation are Transjakarta Bus Stop GOR Sumantri that can be reached by 13 minutes walking (1 km); Sudirman Station is 14 minutes driving distance (5 km); Halim Perdanakusuma Airport can be accessed by driving for 27 minutes (11.2 km). 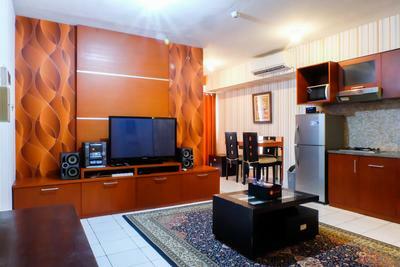 For you who have business purposes in SCBD, Semanggi, and Senayan area are 23 minutes away from the apartment (8.4 km). While embassy offices (Singapore, Hungary, Switzerland, Russia, and Australia) can be reached within 15 minutes (3.8 km). 9 minutes walking to Bakrie Tower (650 m); 15 minutes’ walk to Imperium Tower (1.4 km), and 7 minutes’ drive to Kuningan Tower (2.3 km). Health facility that is located near apartment building is MMC Hospital by 5 minutes’ drive (1.2 km). For education facilities, Bakrie University is only 3 minutes’ drive away from the apartment (850 m) and 9 minutes’ away from Perbanas Institute (2.6 km). Surrounded by mall, café, restaurant to minimarket such as Epiwalk and Plaza Festival that are 8 minutes walking (700 m); 3 minutes’ walk to Casadina Kitchen & Bakery (220 m); FamilyMart minimarket is 2 minutes walking (160 m); 8 minutes’ walking to Bluegrass Bar & Grill and Aphrodite Bar & Restaurant (700 m). Other malls that located not too far from the apartment are Lotte Shopping Avenue by 12 minutes driving (4.2 km); 18 minutes’ drive to Grand Indonesia (6.2 km). Various foreign cultural centre also located not far from the apartment such as Netherland Cultural Center Erasmus Huis that is 13 minutes’ drive (4.2 km); 9 minutes to Jawaharlal Nehru Indian Cultural Centre (2.8 km) and Russian Center of Science and Culture is 14 minutes driving distance (4 km).